Even accepting CBO's "rosy scenario" outlook (see below), it's not evident that it has declared an end to the debt spiral. In fact, it projects publicly-held treasury debt to soar from $12 trillion today to about $52 trillion by 2039. Most people would judge that a spiral. Indeed, as shown in the CBO graph below based on "current policy", the public debt ratio is heading sharply upwards to more than 100% of GDP. 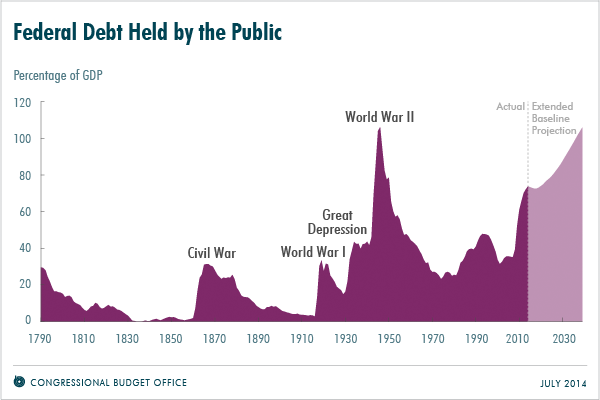 So how does professor Krugman turn this dismal chart into an "all clear" reassurance--when it actually shows public debt heading to above WWII levels at a time when the baby boom is at peak retirement? Well, it seems that Krugman unearthed two numbers in a 182 page report that purportedly render harmless the $52 trillion of bonds, notes and bills that CBO projects will need to find a home at the historically low interest rates it forecasts for the next 25 years. A GDP growth rate higher than the average carry cost of the public debt sounds all good, but here's the thing. Given outcomes during the 21st century to date, there is simply no plausible reason to believe that nominal GDP can grow at a 4.3% CAGR for the next 25 years. In fact, since the pre-crisis peak in early 2008, nominal GDP has grown at only a 2.5% CAGR, and even during the last two years when "escape velocity" was expected any day, the compound growth rate has been only 3.0%. Indeed, during the entire 14 years of this century---encompassing nearly two complete business cycles----nominal GDP has expanded at just 3.8% per annum. Needless to say, when you are crystal balling a quarter century ahead, CAGRs make a big difference, and that's profoundly true of the Federal budget. Specifically, revenue is highly sensitive to nominal GDP growth because it is always money income, not real GDP, that is on the radar screen of the tax-man. Thus, owing to the miracle of compounding under the CBOs 4.3% CAGR, nominal GDP is projected to amount to about $49 trillion by 2039. By contrast, if money incomes grow at a 3.3% CAGR, or at the upper end of the last seven year's experience, nominal GDP a quarter century forward would be only $38 trillion. And at CBO's 19.4% of GDP tax take on the $11 trillion difference----that's nearly a $2.0 trillion annual revenue shortfall by the terminal year. At the same time, the spending side will be driven by the soaring social insurance tab for retiring baby boomers during the decades ahead, regardless of nominal GDP. Accordingly, CBO forecasts that outlays for Social Security and Medicare will rise from 8% to 11% of GDP during the next quarter century, and that this will cause primary Federal spending (i.e. ex-interest expense) to grow at a 4.8% CAGR. But that's where professor Krugman fairly tale of two magic numbers hits the shoals. Based on the above demographic/social insurance dynamics, CBO projects that non-interest Federal spending will rise from $3.3 trillion this year to about $10.3 trillion by 2039. Yet were nominal GDP growth to track the lower 3.3% CAGR suggested above, there would be little off-setting reduction in the primary spending path. That is especially the case because CBO's forecast continues to embody a modern version of "rosy scenario"---that is, it assumes that real output will grow at a 2.3% CAGR for the next 25 years. Yet that ignores the numerous and compounding headwinds lurking down the road. These include baby boom demographics and the massive overhang of $60 trillion of public and private debt domestically; and global troubles everywhere---from the bankrupting old age colony in Japan, to the tottering house of cards known as "red capitalism" in China, to the crushing burden of the socialist welfare state in Europe. Given these adversities, there is no reason to assume that US real growth will sharply accelerate from the tepid trends of the recent past. To wit, real GDP has averaged only 1.0% annually since the pre-crisis peak in early 2008, 1.5% during the last 8 quarters, and just 1.8% during the last fourteen years---including the false prosperity of the Greenspan housing and credit bubble after 2001. So why will GDP growth accelerate by nearly one-third for a quarter century running---when even under CBO's own forecast, labor force demographics will turn sharply negative in the years ahead? Whereas 1.0-1.5% of annual real output growth during the second half of the 20th century was accounted for by labor force expansion, CBO projects this foundational component will drop to just a 0.5% annual rate during the next several decades. This demographically baked in reality, in turn, requires CBO to project that labor productivity will rise by 1.8% annually in order to meet its 2.3% output growth bogey. But that just can't happen. During the next 25 years the US economy will be shedding its most productive labor---which is to say, the now aging baby boom work force. At the same time, the US economy will also be laboring under a severe, cumulative deficit in domestic investment in productive plant and equipment---the sine quo non of future labor productivity growth. Since the turn of the century, in fact, real CapEx growth have averaged only 0.8% annually, or hardly one-third of its prior historical rate; and the true measure of future productivity growth--- net investment in real plant and equipment after capital consumption allowances---has actually declined by 20% since 1999-2000. In a word, the shortfall from CBO's 4.3% nominal growth scenario is likely to come almost entirely out of the "real" component of GDP rather than its 2.0% GDP deflator assumption. This means that nominal Federal spending would likely remain consistent with CBO's projections as outlined above (i.e. COLA adjustments would be about the same), and could possibly rise considerably higher due to a larger caseload of safety net beneficiaries. The baleful bottom line is this. Under the CBO's rosy scenario, the primary Federal deficit by 2039 is just under $1 trillion annually or a modest 1.8% of GDP, meaning that the primary deficit is not fueling an uncontrolled debt spiral. By contrast, under the 3.3% nominal GDP scenario with realistic assumptions about labor productivity and real growth, the primary deficit would soar to nearly $3 trillion annually, and reach 7.5% of GDP. ... because people will fear that we’re about to turn into Greece, Greece I tell you. So talk about unjustified complacency with respect to the public debt spiral! The best outcome we can imagine per CBO's rosy scenario case is a clearly dangerous level of public debt relative to GDP. But the probable path under sober economics is orders of magnitude worse. Indeed, with primary debt accumulating at a nearly double digit rate against GDP, the CBO's average 4.1% interest expense assumption would give way to higher rates, meaning that neither of professor Krugman's two magic numbers cut it. Under a regime of even modest monetary normalization over the next quarter century, current fiscal policy will lead to interest rates that are far higher, not lower, than the growth rate of nominal income. So its time to put Greece right back into the front and center of the US fiscal picture, I tell you!